This HDCVI bullet camera provides stunning full 1080p HD video when used with a HDCVI compatible DVR. This security camera has a 2.8-12mm manual zoom lens that can be adjusted by hand at the camera to attain a viewing angle between 90° and 20° when zoomed in all the way. There are also 42 high intensity Infrared LED so that the camera can see in total darkness up to 130ft away, and even farther if there is ambient illumination. All these great features of the camera are packaged in to a bullet camera housing that is IP66 weather proof, meaning it can be used outdoors in the elements without needing any cover from rain, snow, or dirt. The camera also has a 3-axis bracket that allows it to be mounted on a ceiling, wall, or pole in virtually any angle. The video/power pigtail on the camera passes through the metal mounting bracket making it resistant to tampering. HDCVI technology also enables the high definition video signal from this camera to be run up to 1600ft without signal loss using a high quality solid copper conductor RG59 coax cable. The ability to run video over long distances is specially important for industrial applications, warehouses, and parking lots. If you are upgrading from an existing analog CCTV system, not only is the cost per camera low, but you can use existing RG59 coax cabling to run the video signal. As compared to IP cameras which are more expensive and require wiring to be redone with CAT5e or CAT6, HDCVI cameras such as this bullet camera are an attractive choice for customers looking to upgrade their existing security camera system. If your are looking for HD security cameras with more than 100ft of night vision and manual zoom lens, then we strongly suggest you definitely consider this camera. I now have a 2mp hd-cvi fixed lens camera 1080p but would like the manual varifocal lens. Would this work with my present 60ft 12V Siamese spaghetti cable which came with my system or would I need heavier cable? I have a Q-See QC 9516 DVR. I don't see HD-CVI anywhere in the specs. I would like to run this camera. Will it work with my system? According to the manual on Q-See's website it states that the QC9516 and QC958 DVRs accept CVI cameras, which is the same as HD-CVI. 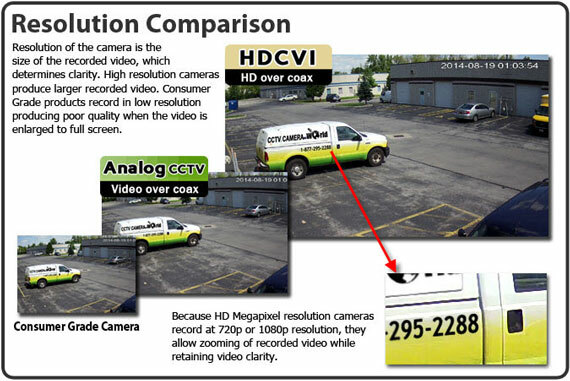 All HDCVI cameras require a DVR to decode the video.